In baseball, an extra base hit (EB, EBH or XBH), also known as a long hit, is any base hit on which the batter is able to advance past first base without the benefit of a fielder either committing an error or opting to make a throw to retire another base runner (see fielder's choice). Extra base hits are often not listed separately in tables of baseball statistics, but are easily determined by calculating the sum total of a batter's doubles, triples, and home runs. The modern-era record for most extra-base hits by one batter, in one game, is five, held by eight different players, including Lou Boudreau, Joe Adcock, Willie Stargell, Steve Garvey, Shawn Green, Kelly Shoppach, Josh Hamilton and Jackie Bradley, Jr.. The record for most career extra-base hits is 1,477, held by Hank Aaron. Another related statistic of interest that can be calculated is "extra bases on long hits". A batter gets three of these for each home run, two for each triple, and one for each double. Thus, leading the league in "Most extra bases in long hits" is a significant accomplishment in power hitting. The statistic Extra Base Hits Allowed (for example by a pitcher or by the fielding team in general) is denoted by the abbreviation XBA. 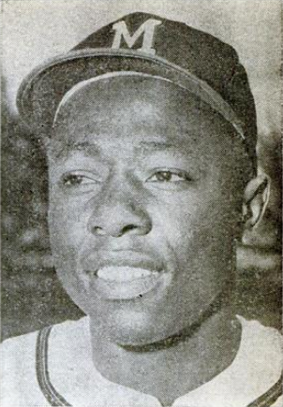 Hank Aaron holds the record for most extra base hits, at 1477. Totals are current through the end of the 2014 season. ^ a b "Baseball Basics: Abbreviations". ^ a b c "Career Leaders & Records for Extra Base Hits". ^ "Single-Season Leaders & Records for Extra Base Hits". Baseball-Reference.com. Retrieved June 11, 2015.